For the province, see Leyte (province). For other uses, see Leyte (disambiguation). The island was known to 16th-century Spanish explorers as Tandaya. Its population grew rapidly after 1900, especially in the Leyte and Ormoc valleys. In World War II, U.S. forces landed on Leyte (October 20, 1944), and, after the Battle of Leyte Gulf, the Japanese were expelled. Since the accessibility of land has been depleted, Leyte has provided countless number of migrants to Mindanao. Most inhabitants are farmers. Fishing is a supplementary activity. Rice and corn (maize) are the main food crops; cash crops include coconuts, abaca, tobacco, bananas, and sugarcane. There are some manganese deposits, and sandstone and limestone are quarried in the northwest. Politically, the island is divided into two provinces: (Northern) Leyte and Southern Leyte. Territorially, Southern Leyte includes the island of Panaon to its south. To the north of Leyte is the island province of Biliran, a former sub-province of Leyte. The major cities of Leyte are Tacloban, on the eastern shore at the northwest corner of Leyte Gulf, and Ormoc, on the west coast. The island was once the location of Mairete, a historic community which was ruled by Datu Ete. Before being colonized by Spain, the island was once home to indigenous animist Warays to the east and other indigenous animist Visayan groups to the west. Leyte today is notable for the geothermal electric power plants near Ormoc. The island measures about 180 kilometres (110 mi) north-south and about 65 kilometres (40 mi) at its widest point. In the north it nearly joins the island of Samar, separated by the San Juanico Strait, which becomes as narrow as 2 kilometres (1.2 mi) in some places. The island province of Biliran is also to the north of Leyte and is joined to Leyte island by a bridge across the narrow Biliran Strait. To the south, Leyte is separated from Mindanao by the Surigao Strait. To the east, Leyte is somewhat "set back" from the Philippine Sea of the Pacific Ocean, Samar to the northeast and the Dinagat Islands to the southeast forming the Leyte Gulf. To the west is the Camotes Sea. Leyte is mostly heavily forested and mountainous, but the Leyte Valley in the northeast has much agriculture. 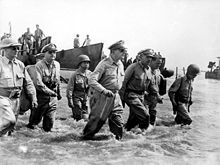 Battle of Leyte: General Douglas MacArthur and staff land at Dulag Beach, Leyte, 20 October 1944. The Leyte provincial capitol is the seat of the provincial government where there is a mural depicting the First Mass in the Philippines, believed to have happened in Limasawa, and the landing of General Douglas MacArthur. The MacArthur Landing Memorial National Park in Red Beach, Palo, marks the 1944 landing by the American liberation forces. It also has a lagoon where a life-size statue of Gen. MacArthur stands. Lake Danao is a violin-shaped lake hemmed by cloud-capped mountain ranges. Kalanggaman Island in Palompon, Leyte is a virgin island with pure white sand. The ecological atmosphere of the island had been preserved by the municipality. The Sto. Nino Shrine and Heritage Museum boasts the painting of the fourteen stations of the cross done by Filipino artists and a bas-relief of the legend of the first Filipino man and woman (Malakas and Maganda). The San Juanico Bridge is the longest bridge in the Philippines. Leyte Island is the birthplace of the Tinikling dance, popular throughout the Philippines. On Friday, 8 November 2013, Super Typhoon Yolanda (Haiyan) destroyed 70-80% of the structures in its path on Leyte province. An estimated 10,000 people died and up to 620,000 people were displaced across the region. The 1959 Japanese film Nobi ("Fires on the Plain"), though filmed in Japan, is set in Leyte in 1945. The film was remade in 2014 under the same name; this version was filmed in the Philippines. ^ "Islands by Land Area". Island Directory Tables. United Nations Environment Programme. Retrieved 12 June 2013. ^ Mogato, Manuel; Ng, Roli (10 November 2013). "Philippines storm kills estimated 10,000, destruction hampers rescue efforts". Reuters. Retrieved 9 March 2016.